A couple of years ago WU was decrying Bitcoin with all it’s might saying how illegitimate is was and so on and so forth, the usual drug money, illicit, terrorism-funding drivel we had back then when people (mainstream sheeple execs in the corporate world) were less informed about Bitcoin and the blockchain. >There is also a monthly remittance maximum of 100,000 Philippine pesos per month (almost $2,000). Bahahahahah. This is exactly why Bitcoin will eat their ever-loving lunch. Money should not be subjected to finaincial fascism like this. Using your money should be quick painless and with minimal fee. But no, we have third party arbitrators who need to take their cut of other people’s value every step of the way. 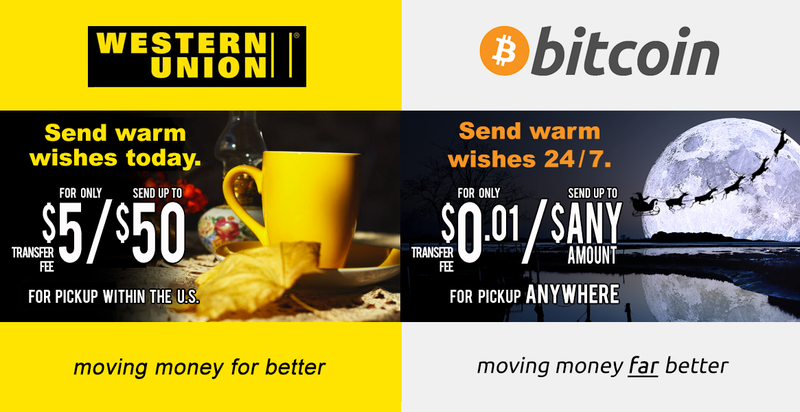 I sincerely, honestly hope Western Union dies a horrible death as a company at the hands of crypto. Bottom left pic sums it up nicely. This is just acquiescence after a (fools) war of attrition, the same thing happened with banks; the tipping point for critical mass may still be way off, but fighting this paradigm shift is stupid and most corps will try to ride the coat tails until they get Kodak’d or Blockbuster’ed out of existence. With a country population of 100M people, 5 million is 5%. That’s pretty surprising, and significant. Additionally, for remittances there is someone on the other end (e.g., a worker abroad), who would buy bitcoin abroad to send.